Search Results for "snow train"
Snow removing train. Tram cleans snow. Cleaning the railway from snow. Snow cleaning with special equipment from rails. Commodity the Express train moves in winter to the Northern forest. A multi-train rushes along the rails shrouded in snow. Trains with tank cars of oil and gas. Commodity train moves in the winter woods. A multi-train rushes along the rails shrouded in snow. Trains with tank cars of oil and gas on the North road. A freight train moving fast through the winter of the Northern forest. A multi-train rushes along the rails shrouded in snow. Trains with tank cars of oil. The railway route. Aerial overhead view of snowed train tracks. 1960s RUSSIA: Snow. Train moves down tracks. People walk down city street. Wooden shacks. 1930s: ALASKA: view across mountains and from train window. Snow on mountain. Train on tracks. Smoke from train. Train Travel in Snow 1. Looking out the window of a train passing through cold snow and harsh winter conditions. Filmed in Canada. Train Travel in Snow 2. Looking out the window of a train passing through cold snow and harsh winter conditions. Filmed in Canada. CANADA 1930s: A man runs up the train tracks and jumps onto the train. View of a snow covered mountain. The train pumps out steam as it drives along the tracks. Railway Station. Night Time. First Time Snowing Quietly. Electric Train Going By. Snow Covered Ground. Bright Illumination. Few Passengers Waiting. Girl Waiting for a Train in the Snow. Attractive woman waiting for a train with snowfall. TOKYO, JAPAN - JANUARY 22, 2018 : Scenery of SNOW from train in Tokyo. 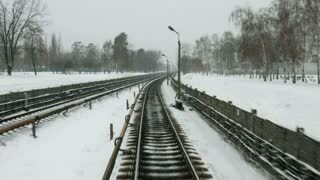 Panning time lapse of a low winter sun behind snow covered train tracks. 1930s: people climb down steps of train onto ground. Rain and snow in mountains. View of mountains from steam train.